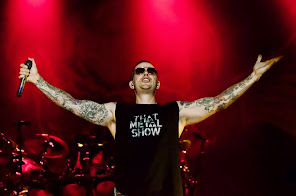 M.Shadows spoke with Folha de Sao Paulo for an interview that the game "Hail to the King: Deathbat" will be released in the summer and the new DVD (did not specify if the DVD will be ready or will be released this summer). In addition, he also said that it will be something special to celebrate the 10th anniversary (although it will be 11 °) of the launch of their album Waking the Fallen. Click here to read the interview.